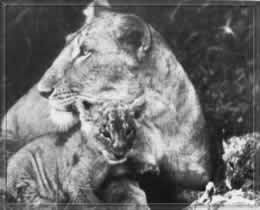 Elsa, an orphaned lion cub, was raised in Kenya by the naturalist Joy Adamson in 1955 and was taken back to the African wilderness 3 years later. Joy Frederike Victoria Adamson was born in Germany in 1910. She worked with her third husband, British game warden George Adamson, in Kenya. She wrote three books about her adventures with Elsa : ' Born free' , ' Living free' and ' Forever free' . James Hill made a movie about this story in 1966. On January 3rd, 1980 Joy Adamson was murdered by a former employee. The Adamsons got Elsa when George had to shoot a wild lioness that attacked him. She had 3 cubs; two of them were sent to a zoo and Elsa, the third one, lived with Joy from then on. When Elsa turned 3 it was about time to teach her to livein the wild. The Adamsons first tried to release Elsa in the Masai-Mara Reserve in southern Kenya. But she couldn't get used to the climate change and became ill. After she recovered they released her at the Meru Reserve. She accustomed quickly but never seemed to be interested in other lions. 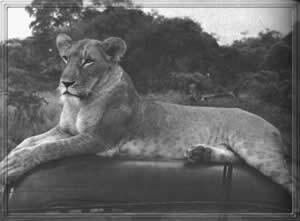 Geroge Adamsom visted her occasionally and in the fall 1959 he, finally saw her with a male lion. Now they knew that she could take care of herself and live with other lions. It was in September when Elsa found her mate which meant the cubs would be born in December. On December 19th Elsa dissapeared and stayed away until Christmas. Joy tried to follow her back to her den several times but Elsa kept tricking her by going the wrong way. Finally, on February 2, 1960, Elsa presented her new family to the Adamsons. She had 3 cubs : Jespha, Gopa and little Elsa. Jespha was the only one who eventually became friendly with humans. The other cubs were always more wild. In the meantime a rival lioness was trying to take over Elsa's territory. 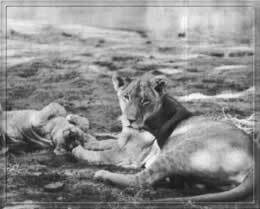 Many a night Elsa left her cubs in camp with the Adamsons while she fought the other lioness. As a Christmas present, the Adamsons recieved an order from the government to remove the lions from the Meru Reserve. They said that because Elsa was half-tame, she was potentially dangerous. 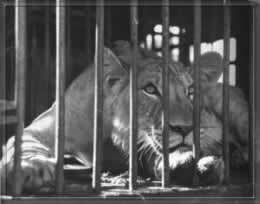 While Joy was in Nairobi organizing a new home for the lions, Elsa became ill with babesia. 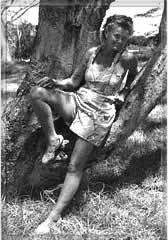 She died on January 24, 1961, just before Joy returned from Nairobi. After her death the cubs became very shy and wild. They started to kill livestock, which the local tribesmen did not like at all. For that reason the Adamsons moved the young lions to the Seringeti in May. Even though Elsa had died almost a year before the cubs would have normally lived on their own, they adjusted there very well and were living free in the wild.